Greetings! Most of you have probably seen me on the track. 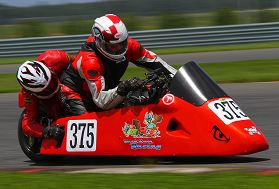 I live in Middletown, MD and race a sidecar with you at Summit. I've also ride an antique trials bike (which also has a sidecar) and a FZ-09 (no sidecar). Next year I plan on taking the FZ-09 to a track day (have to figure out the rules first) and learn how to ride it better. I'll do some research and ask stupid questions later on how to get ready for that. I didn't know any of our sidecar friends were from anywhere near here, I thought they were all from Canada. Feel free to ask all the questions you like. In this day and age the forum doesn't get a lot of traffic, but we check it here and there. I know if I don't know the answer I can scare up someone that does. I'm the closest (so far). Bill is from MA, Fran is from MI and Peter is from NH. The rest are Canadians. and standby on the questions! I'm busy right now trying to get my rig ready for NJMP in a few weeks.